Rubber Ducky I'm awfully fond of you! That's my baby, all she loves is yellow and rubber ducks. 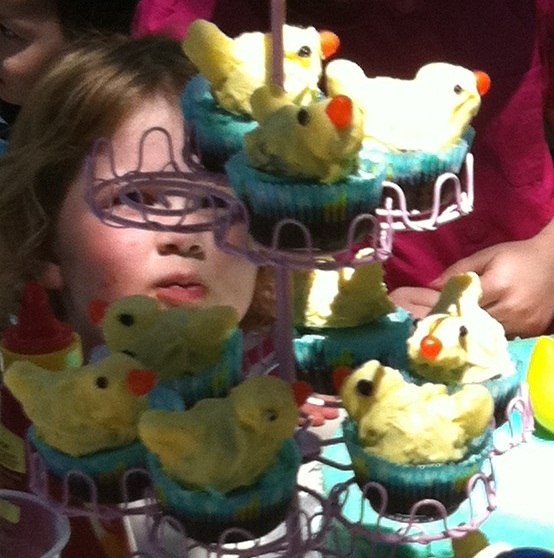 SO for her birthday party we did a Rubber Ducky party and made a Rubber Ducky birthday cake. This was relatively simple. We held the party in the park, which of course had lots of ducks. I made a simple butter cake and covered it in butter cream icing that I tinted blue for the water with Queen's blue food colouring. I used some Aeroplane blue jelly and made a small amount and when it was almost set, I placed a small amount on the cake and then placed the rubby ducky on top and Voila!!!! I found some gorgeous little ducky patty pans. I then made some little cupcakes. I iced the cupcakes with the same blue icing. I made some little ducks. I used a banana lolly. I sliced a section off of one end, and placed a marshmallow on as the head. I melted some Nestle White Milk Melts tinted it yellow with a few drops of Queen Yellow food colouring. I covered the banana / marshmallows with the yellow melted chocolate. When the chocolate was almost set, I placed a currant on either side as eyes and used small orange or yellow jelly beans as the beaks. 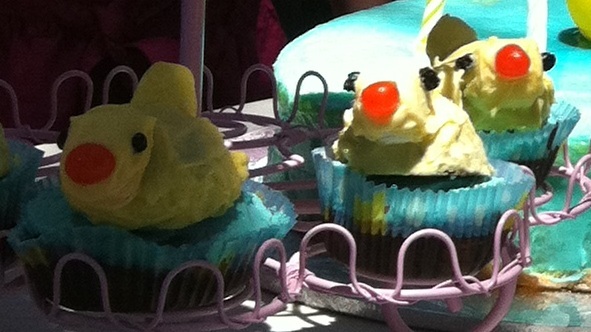 Unfortunately we forgot to take some photos of the ducky cupcakes. But here is a photo with them on the cupcake stand.